There is much controversy surrounding the right type of baking pan. Silicone baking pans were introduced many years ago. Searching Google resulted in articles dated back to 2004, which primarily discussed the ease of use and safety of silicone as it related to baking and cooking utensils. The majority of silicone baking information was initially favorable. Spatulas with a 500-degree safety rating along with baking mats proved to be the most popular products. Presently there is a vast difference in the opinions surrounding silicone bake ware. Many say it alters the flavor, cooks unevenly, and is unsafe while others say the complete opposite. Vowing to improve my baking skills and knowledge in 2010 along with the desire to form my own opinion prompted this baking pan comparison. My family love brownies and suggested trying an individual brownie pan after seeing a commercial on television. Buying one sounded like a reasonable idea especially since I had an Amazon gift card from a previous Twittermoms blog opportunity. 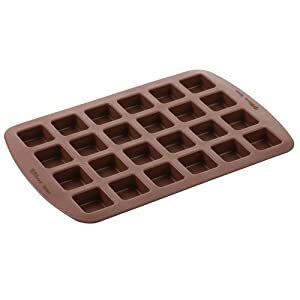 My first choice was this Wilton 24-Cavity Silicone Brownie-Squares Baking Mold. The price on Amazon was $9.99, with free shipping, an offer I just could not refuse! My second choice was this Chicago Metallic Slice Solutions Brownie Pan. 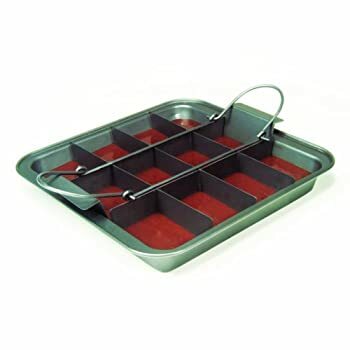 Being very curious about baking with silicone, given the price difference, and the fact that this made 12 large brownies I chose the Wilton brownie mold. On Saturday, I planned to use the brownie mold for the first time. The instructions said nothing about use only care so off to Google I went reading users tips, wrong move this time. The Amazon product description included, “For best results, grease each indentation with cooking spray or solid vegetable shortening prior to baking.” Duh! Anyhow, after reading many tips that insisted no greasing was necessary, I proceeded to prepare the Reese Chocolate Chunky Brownies for my great niece’s birthday without greasing the mold. Guess what, every brownie stuck on the bottom. The shapes were perfect but I had to carefully lift each brownie out of its mold. The success rate was 20 out of 24 but how aggravating! There was no difference in the taste from using metal, no problem there. Cleaning was also tedious as the brownie mix hardened in the corners. Even though my first attempt with this silicone brownie mold was a bit difficult, I am not prepared to dismiss the silicone baking and cooking tools just yet. Clearly, I should have greased each cavity, my bad. However even if I never found the instructions, owning several silicone spoons and spatulas that perform excellently leads me to give this brownie mold another attempt using cooking spray! BTW – This is a personal review of baking pans, not a sponsored review. I received no compensation from Amazon, Wilton, or Chicago Metallic. Which do you prefer silicone or metal baking pans? Do you have an opinion or experience with silicone baking pans, please do share. I just have a question, which is harder to clean up, a silicone pan or the metal baking pans?